Wow what a surprising, beautiful film that I had no knowledge of. To be honest never even heard of it. When I saw Twilight Time’s release schedule for the month of August I was a little taken back by this title. I had been shocked once before with the release of The Twilight Samurai which was a relatively new film coming out in 2002. I guess I get this idea inside my head that Twilight Time only releases older films and so that mentality I have to get out of. The Little House is a brand new movie which came out in 2014. And now I say this with all honesty, what a film. This Japanese piece of cinema is flooring. The man behind the film the director surprisingly also directed another flawless film put out by Twilight Time Blu-ray, the one I mentioned, The Twilight Samurai (YOU CAN READ MY REVIEW FOR IT HERE). After I saw who directed The Little House I knew then that I was ready for this film. I knew the talent and the expertise of this powerful director. Yoji Yamada is by far one of the greatest film directors of all time. His mastery is not able to be described into a word format. You just have to see his films to fully understand his mastery. The Little House is another one of those fantastic examples of beautiful, and thought provoking cinema that never lets go of you. Twilight Time Blu-ray graced this passionate drama with a clarity, and a vibrant understanding on just how important this piece of cinema is. I speak highly of this movie. A wonderful drama that takes you back in time to the 30’s and 40’s, and allows you to experience Japan. The story unfolds through a narration of believability that places you there in all the happenings on screen. The plot is set in Japan. In the era of the 30’s and 40’s, and the coming war is also an added factor. The story is told by Taki Nunomiya, who is in the present, an old woman looking back over her past. Her tale is that in the 1930’s she was taken to Tokyo as a servant to be placed in a household, and become there maid. 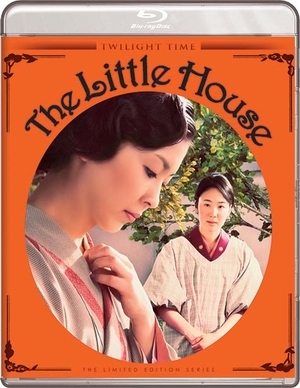 Through, The Little House, the drama unfolds in great detail as the story is told. The upcoming aspect of war, a love affair that can only have a disastrous outcome, and every aftermath that awaits. I don’t want to sound clichéd, but I have to, this is a perfect film. A perfection of beauty through story, acting, directing and an experience of drama. This is lovingly shot by Masashi Chikamori. The cinematography is utterly mind numbing. The whole film, seems real. The costumes, production, sets and everything is detailed with a brilliance that is flooring. I absolutely love Yoji Yamada as a director, and visionary of film. This is must see, and must own experience. A beautiful vibrant Blu-ray. A top quality product and perfect example of how to treat an important piece of cinema with a lovely transfer to blu-ray quality. As I have stated beautiful, vibrant and crisp in imagery. The sound is phenomenal. The audio and video is priceless. You get the very important isolated score track. The music in this film is another one of its breathtaking realities. The score by Joe Hisaishi is a stunning ear candy. Now all one has to do is look at the career of Hisaishi. He has mastered some of the greatest film scores, at least in my lifetime. He was responsible for the music, for two of my favorite animated films of all time, two of my favorite films period. 1984’s Nausicaa of the Valley of the Wind, and 2001’s Spirited Away. He has worked on many of the wonderful Ghibli Studios animated features. He is a master that lives the music. He understands the beating heart of music and it showcases in all his films. You also get original theatrical trailers. And one of the most important aspect is the small insert booklet about the film written by film guru and film historian, Julia Kirgo. As always a true treat to read. Passionate. Powerful. Dramatic. A story of excellence acted out by flawless performances.